The primary massing task for this prototype is to create a branching column. A column whose central bulk is able to split into smaller footprints; downwards to engage with an irregular ground, upwards to maximize light penetration and air exposure to living units. Additionally, to increase the structural performance of the splitting column, a corrugated wall is introduced. The study of Eladio Dieste’s vertical ruled surfaces initiated this set of experiments. His use of conoids to amplify the surface of a wall does not only inform an augmented structural resistance to the overhanging arms but also demarcate the spatial and living organization of the column. The degrees of protrusions and recesses described by the geometry of the irregular corrugated wall are the result of environmental analysis, corresponding to the level of solar radiation the column receives yearly, based on its orientation and climate (sub-tropical Hong Kong). The more the sun exposure, the greater the amplitude of the corrugation becomes to provide properly shaded inlets. Each unit type comprises of spaces both inward and outward facing, delineated by the undulation of the structural wall. The main issue became how to translate this specific geometry into material and how to synthesize an operational construction procedure through formwork design. Additionally, undercuts arises from the resulting geometry, making the removal of the formwork ever more challenging. 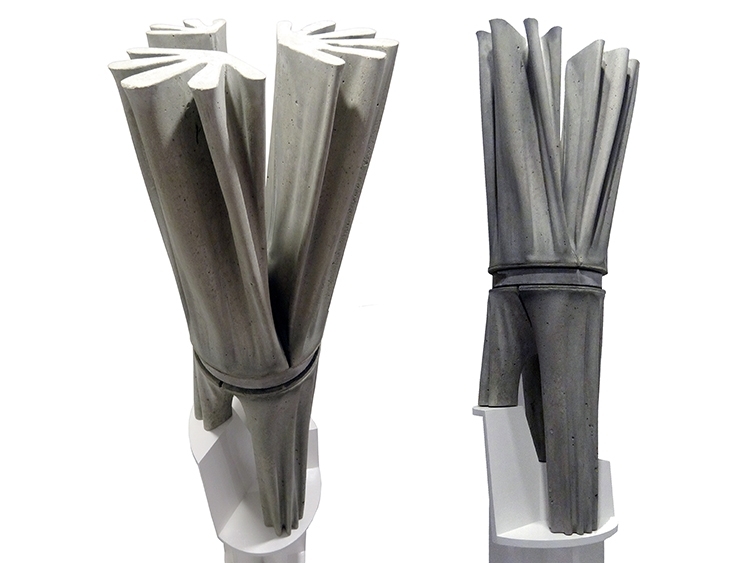 The final strategy involved a three-step process; by first materializing the corrugated geometry as a positive, in order to cast the negative in rubber so that the concrete cast positive can easily be released at the end of the curing process. The innovation in this procedure resides in the making of the first positive. By simply describing the various 2d edge profiles, a timber skeleton is fabricated onto which a sheet of geotextile is stretched to precisely interpolate the remaining 3d geometry. The method employs simple means to fabricate complex geometries and is found more effective in deriving an optimized form description than existing cumbersome processes concerned with the making of rigid and lost formwork (plaster copy or CNC milled positives). Once properly secured onto the timber framework, the fabric is then hardened with epoxy coating, ready to be cast. Improved versions of this technique have been incrementally experimented with in the making of subsequent column prototypes. The number of steps, the casting process required, remains something to improve on. Further experiments with this technique seek to eliminate the intermediary rubber casting in order to make the procedure even more expedient and economical.